CHINAPLAS 2012 concluded on April 21 at Shanghai New International Expo Centre, China, creating new records in exhibition area and numbers of exhibitors and visitors. 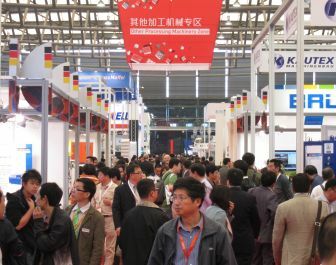 Ranked as Asia’s No.1 and the world’s No.2 plastics and rubber show, CHINAPLAS 2012 expanded to 210,000sq m, an increase of 16.67% from 2011 and a 40% increase in comparison with the edition held two years ago in Shanghai. In terms of visitors, there was a breakthrough of 5-digit number to 109,858 with growth rates of 16.77% and 34.9% versus 2011 and 2010 respectively. Mr Chu, Bu Zheng Fa, President of China National Light Industry Council, Chen Shi Neng, Honorary President of China National Light Industry Council, Yu Qingji, Executive Vice President of China Machinery Industry Federation, Dirk Elbers, Lord Mayor, City of Düsseldorf, Qian Gui Jin, Vice President of China National Light Industry Council, Cao Jian, Vice President of China Plastics Processing Industry Association, Zhang Jingzhang, President of China Plastics Machinery Industry Association, Werner Matthias Dornscheidt, President and CEO, Messe Düsseldorf GmbH, Bernhard Merki, President of Europe’s Association for Plastics and Rubber Machinery Manufacturers (Euromap), Chen Ming, President of Shanghai Society of Plastics Industry and Liu Jing Fen, Vice President & Secretary General of Shanghai Society of Plastics Industry officiated at the ribbon-cutting ceremony on April 18 to mark the grand opening of this mega plastics and rubber trade fair which occupied an exhibition area of 210,000sq m.
2,729 exhibitors coming from 36 countries and regions filled up 25 exhibition halls, enjoying another double-digit growth of 12.1% compared to 2011. The show also welcomed over 500 new exhibitors who were optimistic about the plastics and rubber industries in China and Asia. Some of the renowned new comers were LG Chem, Daelim, Styrolution, Orion, Kao, ESOPP, Senvo, Shihyao, Enaiviv, Shantou Auto Packaging Machinery, Zhongshan Guzhen Huaxin, Wells, Fukan Plastics and Techne-Graham, etc. It is worth mentioning that two new pavilions from Korea and Thailand joined CHINAPLAS this year, boosting the number of pavilions to 13 and breaking last year’s record. The rest of the pavilions came from Austria, Canada, France, Germany, Italy, Japan, PR China, Taiwan, Turkey, UK and USA. The prominent presence of these pavilions strongly proved the rising status of CHINAPLAS in the international arena. The leap over of 100,000 visitors contributed from not only local but also overseas visitors. CHINAPLAS this year gained 28,110 overseas visitors, which was 25.59% of the total. They came from 150 countries and regions with Korea, India, Japan, Indonesia, Taiwan, Thailand, Malaysia, Russia, Hong Kong and Iran as the top 10 origins which accounted for 62.83% of overseas visitors. Over 50% of overseas visitors came from Asia excluding Hong Kong, Macau and Taiwan (55.43%), followed by Europe (10.88%), Middle East (9.49%), Hong Kong, Macau and Taiwan (8.93%), America (8.57%), Africa (5 %) and Oceania (1.7%). As for local visitors, Eastern China (excluding Shanghai) formed the majority which was 47.25%, followed by Shanghai (26.68%), Southern China (12.19%), Northern & Northeastern China (7.7%) and Central, Southwestern and Northwestern China (6.18%). Each year, delegation groups flocked to the show on the first two days. This year, over 100 groups of key buyers, corporations and associations, representing different application sectors, came from all over the world, including Brazil, Colombian, India, Indonesia, Iran, Japan, Korea, Malaysia, the Philippines, PR China, Russia, Taiwan, Thailand, Turkey, Ukraine and Vietnam. The strong attendance of renowned enterprises, such as Foxconn Technology Group, L’Oreal, MicroPort Medical, Rexam Plastic Metallizing Technologies and United Automotive Electronic Systems, etc has fully demonstrated the leading role of CHINAPLAS as an effective sourcing platform for plastics and rubber technology. To demonstrate the theme of “The Future is in Plastics and Rubber”, the “Future Zone”, comprising “Future Car” and “Premium Design Gallery”, succeeded in capturing the attention of all participants. The “Batshark”, champion of the “Future Car” design competition operated under the “Nurturing Our Future” program, was unveiled at the opening day. Specially created by a group of students from the East China University of Science and Technology, the “Batshark” features a smart operation system and lightweight and green technology, revealing a forward-looking future in the plastics and rubber industries. Another part of the “Future Zone” was the “Premium Design Gallery”, which showcased a series of new, innovative and unique design of various plastic-made end products. Highlighted exhibits included a “Tree of Life” which is made of polycarbonate film; a Solar Impulse aircraft model which uses solar energy as the power source; chairs which possess delicateness, high mobility and various designs on shapes; three cutlery items that can be joined to form a small yet stable free-standing sculpture. CHINAPLAS’ rising reputation was also confirmed by the extensive affirmative recognition from exhibitors who achieved a fruitful result during the 4-day show. “We have exhibited at CHINAPLAS for more than 10 years. UBE participated in many important plastics trade fairs like K, NPE and IPF, and CHINAPLAS is also one of them. Here in CHINAPLAS we can build relationship with old clients and find new customers in Asia. The buyers we are looking for are from the packaging, auto and fishing industries. We receive good response and gain some potential prospects from these areas,” said Tokuhiro Sakida, Manager, Investor Relations & Public Relations Department of UBE Industries Ltd. The brilliant results achieved in 2012 provide CHINAPLAS a solid foundation in gaining more overseas visitors and exhibitors and reaching another climax in the coming future. The organizer announced that CHINAPLAS 2013, with an expected exhibition area of 220,000sq m, will be staged at China Import & Export Fair Pazhou Complex, Guangzhou, China, from May 20-23 next year.